Love means never having to say you're sorry... Love Story. Everyone loves Love Story! One of the most romantic movies ever made also remains one of the most enduringly popular. This heartfelt 1970 tale of the love of a lifetime-the most successful Paramount movie up to that time-received seven Academy Award nominations (including Best Picture) and won one for Francis Lai's magnificent score. As filming was underway on Love Story, the filmmakers knew they had something special-so special that Erich Segal was simultaneously shaping his best-selling novel from his own screenplay. 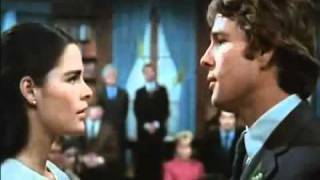 Stars Ryan O'Neal and Ali MacGraw each received Academy Award nominations and became overnight movie sensations for their poignant portrayals of a young couple who cross social barriers, marry and ultimately face the greatest crisis of all.